The Prophet Joseph Smith did not have any major interaction with Catholic clergy or the Catholic faith until 1839. The site of the future city of Nauvoo was hardly a beautiful place. It was a swamp on a bend of the Mississippi River and was infested with mosquitoes. Many Mormons suffered bouts with malaria and even death. Through much diligence the Saints persevered. They were able to eventually drain the swamp and construct a beautiful city. In those days, Nauvoo was the largest city in the State of Illinois. It exceeded the size of Chicago which was merely a dusty little cow town. Although Nauvoo was primarily a Mormon community, the Catholic Church had been active in the area as early as 1820. Traveling priests had planted apple orchards on the west side of the river, however, they did not have a regular presence in the area until 1840. The Catholic parish record tells us that the two groups got along well. During the time when the Mormons occupied Nauvoo, the Catholics were permitted to celebrate Mass in the Mormon Mansion House on Main Street, in the Mormon Hall of Seventies, located on Parley Street, and in the Mormon temple, commonly referred to as the Nauvoo Temple, where a place was set aside for the Catholic people of the vicinity (Pamphlet excerpt, pg.1 “Highlights of the SS Peter and Paul Parrish. Nauvoo Illinois, 1986). Joseph Smith befriended a Catholic priest named Father Aleman. He was a priest in the neighboring McDonough County. Their interaction in the 1880’s is recorded in the Catholic NRI History File. Even though the Mormons thought they had found a place of refuge, the violence and persecution followed them to Nauvoo, and in 1844, Joseph Smith and his brother Hyrum were martyred in the Carthage jail in Carthage, Illinois. Even after the martyrdom of the Prophet, the persecution continued and Brigham Young and other Church leaders fled the United States for Mexican territory with the blessing of the Mexican Government. The Mormons settled in numerous places including the Salt Lake Valley. When the Mexican American War culminated with the Treaty of Guadalupe Hidalgo in 1849, the Mormons were again within U.S. territory. After the war, the Mexican Government extended invitations to repatriate Mormon citizens who were affected in former Mexican territories. Parley P. Pratt, one of the Latter-day Saints in Nauvoo, owned a General Store and stayed behind to assist Mormons in their preparation for the Westward trek. In 1848, Pratt sold his store to a Catholic priest named Father James Griffith for $900. 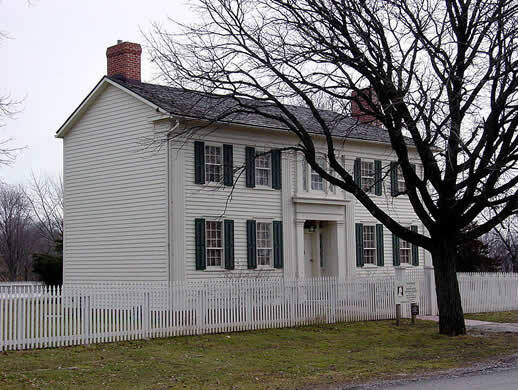 Griffith was the first resident pastor in Nauvoo and he used the store for a rectory and church building. In 1873 the first Catholic Church built in the traditional style was completed in Nauvoo. “Highlights of the SS Peter and Paul Parrish,” Nauvoo Illinois, 1986. Pamphlet excerpt, pg.1. Larmer, Rev Father John, History of McDonough County c. 1880 with photocopy in NRI History File. Cannon, Janath R. Nauvoo Panorama Nauvoo Il: Nauvoo Restoration Inc. 1991.